Rwanda is a landlocked country measuring 28.000 km² in size and is inhabited by 7 million people. It is one of the most densely populated countries in the world. Air transport is indespensable to the socio-economic and political development of the country. Kigali International Airport is the gateway to the outside world. The airport has regional, national and International Strategic Significance. It is one of 17 airports identified by the ECA as a future hub network on the African Continent. The authorities in Rwanda recognises the crucial importance of Kigali International (KIA) and are making efforts to improve its airport infrastructure and air navigation facilities with a view to maintain ICAO standards. The decision to rehabilitate the Kigali-Kanombe Airport dates back from December 1977, when preliminary estimates for the required conversions to enable the runaway to accommodate the Boeing 747 were drawn up under arrangements by two Ministries: on one hand the one responsible for Transport and Communications, and on the other, the one responsible for Public Works. In May 1978, Rwanda submitted to France a request for funding of the construction of a new Air Terminal, in the framework of a program to rehabilitate the Kigali-Kanombe Airport. In response to the request of the Rwandan authorities, the Société Française d'Etudes et de Réalisation d'Equipements Aéronautiques, SOFREAVIA, had submitted a Study Proposal, and the final, approved deal was signed on 6th October 1978. These construction works included the establishment or strengthening of infrastructures, the construction of buildings including a Hydrocarbons' Warehouse as well as the supplying and installation of electric and electronic equipment. 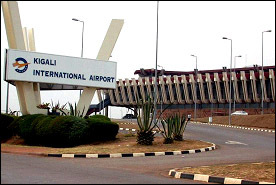 The 1994 war that affected many of the country's infrastructures did not spare the Régie des Aéroports du Rwanda (RAR). The Passenger Terminal, the Technical Unit, and the Power Station, the runway drainage system, parking area for vehicles, and areas that were damaged by shrapnel. It is anticipated that there shall be, in the near future, a project to rehabilitate the Airport that is funded to the amount of 22 million Euros (22,000,000 Pounds Sterling) by the European Investment Bank (EIB) and the European Development Fund (EDF). Rehabilitation of the fire hydrant and increase of revitalisation outlets within the aircraft parking area. Strengthening of the existing aircraft parking area currently measuring 21,000 m2 and construction of its northern extension measuring a surface area of 37,000 m2. Phase B: Included the construction of two buildings; the power station and the warehouse measuring up to 820 m2; and to transfer the Hangar for light aircraft towards the southern end of the runway. Phase C: Icluded the construction of a Hydrocarbons' warehouse with a capacity of 1,750 m3. Phase E: Included the construction of a new Air Terminal with a surface area of 7,750 m2 of three floor levels, with a ground floor measuring 3,600 m2 designed to accommodate 400 passengers per hour. Phase F: Included the supplying and installation of electronic equipment for aeronautic telecommunications, and radio-based assistance to aerial navigation, mostly comprising the construction of a broadcasting centre. Three parking areas whose installation was totally carried out by the Rwandan Government, and which signify the latter's participation in the program as a whole. Lastly, still within the framework of the same rehabilitation program, a study on the organisation and management of the Kigali Airport was carried out by AEROPORTS DE PARIS. The total cost of the entire program amounts to US$ 35,000,000 and was funded respectively by the Rwandan Government on one hand, and Belgium, France, Abu Dhabi, OPEC, and Koweit on the other hand. Régie des Aéroports du Rwanda was established by a Presidential Order, N° 32/12 of January, 1986 for the purpose of management, operation and maintenance of the airports in Rwanda. Régie des Aéroports du Rwanda has no legal personality or corporate autonomy. La guerre de 1994 qui a touchée beaucoup d'infrastructures du pays n'a pas laissé la Régie des Aéroports du Rwanda (RAR). des purges dans la piste et au parking automobile aux endroits endommagés par les éclats des obus. les équipements de fouille passagers et bagages de l'aérogare. Dans un proche avenir commence un projet de réhabilitation de l'Aéroport financé de 22 millions d'Euros ( 22.000.000 € ) par la Banque Européenne d'Investissement et le FED (Fonds Européen Dévloppement ). l' A 330-600 et le B 777-300. La réhabilitation de l'hydrante et l'augmentation des bouches de ravitaillement dans l'aire de stationnement. La connection sur le réseau VSAT de la SADC pour des communications AFTN et ATS/DS. L'installation de trois groupes de secours et création de trois sous-stations pour mieux alimenter en énergie les équipements aéroportuaires. La réhabilitation entière de la centrale électrique c-à-d de la cellule moyenne tension jusqu'à l'armoire de distribution basse tension. Installation d'un système de contrôle et de commande par ordinateur du réseau électrique. Kigali Airport is the only International Airport. Out of the other six Aérodromes, only two i.e Kamembe and Gisenyi have some schedulled traffic. Administration and Management of Civil Aviation in Rwanda is done by Régie des Aéroports du Rwanda and Aéronautique Department in the Ministry of Public Works, Transport and Communications. 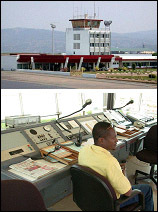 The department of Aéronautiques provides the regulatory aspects of Civil Aviation and oversees their application while Régie des Aéroports du Rwanda provides essential Infrastructure, Installation facilities and services for Civil Aviation in order to meet its mandate of providing safe, efficient and secure Air Transport Services. Table about total cargo, and total mail. Recently, International Civil Organisation (ICAO) do recognise the importance of countries to have Civil Aviation Authorities. This helps authorities to adopt acceptable and recognised commercial business practices and also organised and managed as autonomous entities. Therefore it is within this framework that the Government of Rwanda Commissioned ICAO to study the possibility of Régie des Aéroports du Rwanda to become Civil Aviation Authority. · Whereas this could improve operational efficiency and financial results, states consider establishing autonomous authorities to manage their major International Airports, route facilities or both. · The decision to establish an authority should be based on a feasibility study identifying potential improvements in efficiency and financial results to be gained there from and describing how these could be realized. A feasibility study was conducted in accordance with terms of reference and a recommendation was made that a Civil Aviation Authority be established. This has to be in charge of all civil aviation functions as a parastatal fully owned by the Government as its sole shareholder. The CAA will be allowed to function autonomously according to formal business practices and should be operational by end 2002. The implementation plan will be carried out in 3 phases, each with its distinct objectives, tasks. The readiness of each phase passes on to the next phase. Phase 1 will last from the point at which the government of Rwanda formally decides to proceed with creation of CAA. · The overall objective of phase I is to make all provisions in support of the viable creation of CAA. Phase II will not last for no more that 1 year starting from the date on which CAA is legally in place. · The overall objective of this phase is to establish the CAA firmly as an autonomous decision making entity. · The overall objective of phase III is vigorous pursuit of all opportunities in fulfillment of the CAA's mandate. Bar and restaurant for both passengers on transit and the Public. The terminal building has sufficient gates to allow the passengers more freely. The public area has 8 gates, transit hall has 3 gates, VIP lounge has 1 gate, arrival area has 3 gates.